In week 3 of the NFL’s regular season, teams begin to see some separation between the contenders and the pretenders. For the Indianapolis Colts, if they want to set their sights on Super Bowl LI in Houston, it was a chance to get the season back on the right track after a third straight 0-2 start. Finally, Colts fans everywhere can breathe a sigh of relief. Indianapolis Colts quarterback Andrew Luck looked like the same-old Andrew Luck for three and a half quarters of Sunday’s game against the San Diego Chargers. Luck got blasted by the Chargers defensive line, fumbling what would become a Chargers touchdown. Later in the game, Luck would follow his #1 option with his eyes and throw an interception that would lead to the Chargers taking the lead. But down 22-20, Luck stepped up into the pocket and threaded the needle to wide receiver T.Y. Hilton, who was crossing the field. And the rest was left to Hilton. That would give the Colts what would be the team’s game-winning touchdown, on a day where Hilton hauled in eight catches for 174 yards and that game-winning touchdown. The Colts received a wonderful gift heading into Sunday’s game against San Diego, getting defensive starters Clayton Geathers, Vontae Davis and Henry Anderson back from injury. These returns proved to be a game changer, as the Colts defense seemed to hold off a potent Chargers offense, led by quarterback Phillip Rivers. The Chargers would be held to just one offensive touchdown, on a run by running back Melvin Gordon. Indianapolis held the Chargers to just 37 total rushing yards, and Rivers, though passing for 330 yards, would not throw a single touchdown pass. As the Chargers got the ball with 1:17 left, down 22-26, Rivers completed a pass to rookie tight end Hunter Henry, who would take it for a first down as Colts safety Clayton Geathers punched the ball out, recovered by safety Mike Adams. Game winner from Luck to TY, a fumble recovery and finally… THE #COLTS WIN! After notching their first win of the season, the Colts are heading overseas! Indianapolis takes their first trip to London for the NFL’s International Series against divisional rival Jacksonville Jaguars. 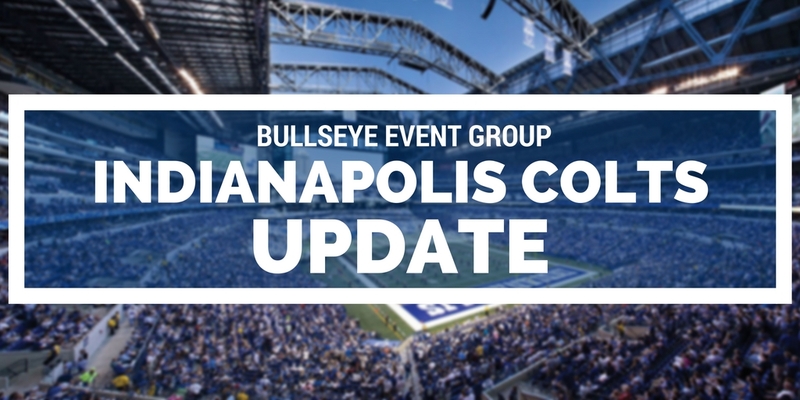 Nearly 250 Colts fans from Indianapolis will be traveling with Bullseye for Sunday’s game at London’s Wembley Stadium, where the Colts will be looking to pull their record to an even .500. A special kickoff time in the United States, as the teams take the field in London at 9:30 am ET!